I have been quietly anticipating the release of Star Wars: The Force Awakens. To that end I have been avoiding the marketing and hype as much as I can - until a couple of evenings ago when after seeing a snippet of Daisy Ridley and John Boyega chatting on the news - the switch flipped - there is no containing my excitement - bring on December 4orce, secondarily I thought I would finish this piece on my visit to George Lucas' Star Wars: Visions Exhibition in Tokyo. Incidentally since writing this I believe I have the entire Legacy featurette that the aforementioned Ridley & Boyega interviews were part of, I have embedded it below and it's worth watching just to see their reactions to being on the Star Wars: The Force Awakens set. Earlier this year I was fortunate to fulfil a lifelong dream and visit a land far, far away. And I have to say - Japan, the land of the rising sun, far exceeded my expectations on every level. I hasten to add that Japan might be famed for its rising sun but its sunsets are absolutely spectacular. Whilst I didn't manage to team up with a travelling troupe of Ninjas and defend beleaguered farmers against an out of control warlord's hordes or find a Hattori Hanzō sword (or even an ancient Masamune Katana folded 200 times) I did however manage to wander the land, meet people... get into adventures and stuff. 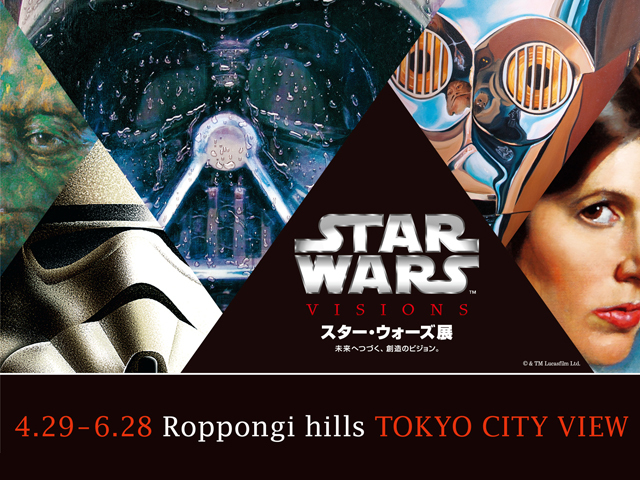 When planning my Japan itinerary I was stoked to see that an exhibition dedicated to Star Wars called Star Wars: Visions would be on in Tokyo at the same time as I would be there. 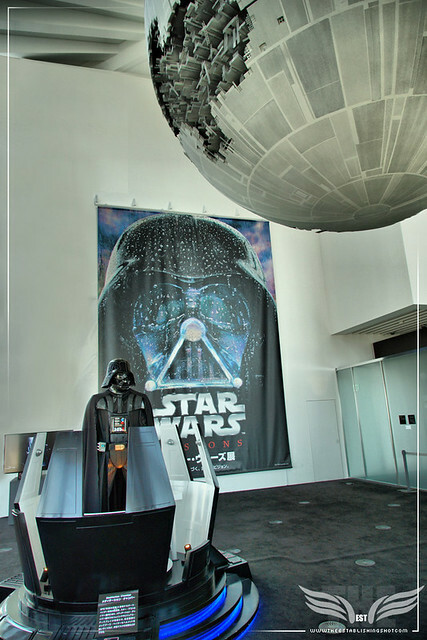 This was fortuitous as a little while back I had made tentative plans to visit the Star Wars: Identities Exhibition in Paris, my plans fell through and the exhibition moved on to its next international destination. London doesn't seem to be getting any Star Wars Exhibition love of late, in comparison to The London Film Museum's exceptional 2007 Star Wars: The Exhibition at least, so Star Wars: Visions was something I was keen to visit. However, my itinerary was fairly loose to say the least, as I intended to do a lot of travelling around Japan and as much as I intended to “plan the dive then dive the plan. I had no idea where I would end up from one day to the next or how long I might be there. If I may digress? My experience is that when it comes to travel you can plan for your expectations but if you can be flexible - some of the best experiences are the unexpected ones and you never know what new adventure or taste lies around the corner in wait. So there was a good chance I might not see the exhibition but it was on my radar. 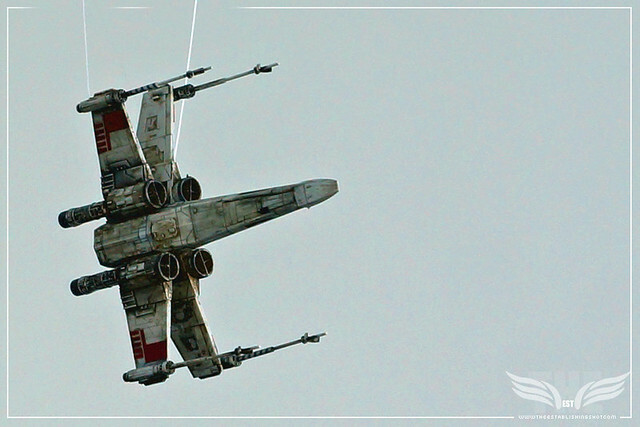 Star Wars was released in 1977 and firmly placed itself into film history as well as became a cultural phenomenon. An ingenious mix of a universe with compelling characters, an engaging weave of history and war, a variety of diverse planets, spacecrafts and weapons, the use of state-of-the-art video technology combined with a timeless story has captured the imagination of many, many fans. Given Japan's contribution to Star Wars, particularly the films of Akira Kurosawa and its ardent Star Wars following it's no surprise that in the run up to the release of Star Wars: The Force Awakens George Lucas decided to bring the Star Wars: Visions Exhibition to cities around Japan before taking up a permanent residence in Chicago at the Lucas Museum of Narrative Art in 2018. George Lucas even wanted legendary and influential Japanese actor Toshiro Mifune most notably known for his collaboration with Akira Kurosawa and roles in films like; Rashomon, The Hidden Fortress, Seven Samurai, Throne of Blood, Yojimbo and Red Sun or Soleil Rouge, for the part of Obi-Wan Kenobi, then Darth Vader but Mifune past on both roles. Clearly Obi-Wan's Jedi robe and Lightsaber are nods to Japanese culture and Darth Vader's head gear is a modernised Samurai helmet. George had described Vader as having flowing black robes. In the script, Vader had to jump from one ship to another and, in order to survive the vacuum of space, I felt he needed some sort of breathing mask. George said, 'OK', suggested adding a samurai helmet, and Darth Vader was born. Simple as that. 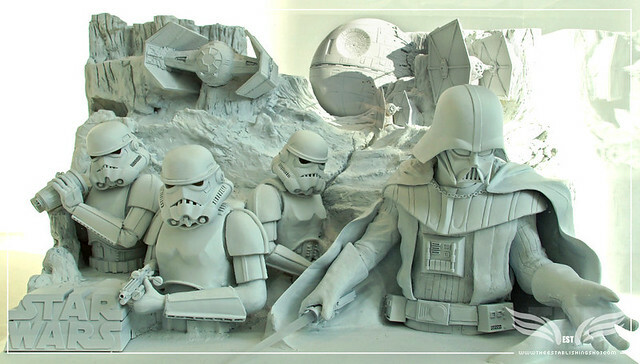 As George Lucas was inspired by other works of popular culture for his vision of Star Wars, he invited artists selected from all over the world to draw upon the entire Star Wars galaxy for inspiration in creating their own original interpretations of Star Wars. 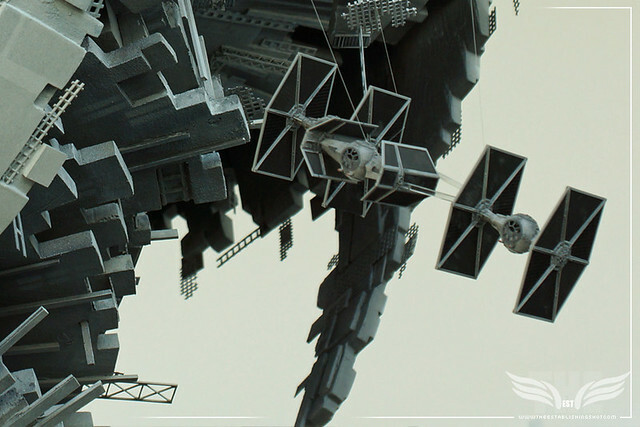 The Star Wars Visions Exhibition showcases their art for the first time under one roof. 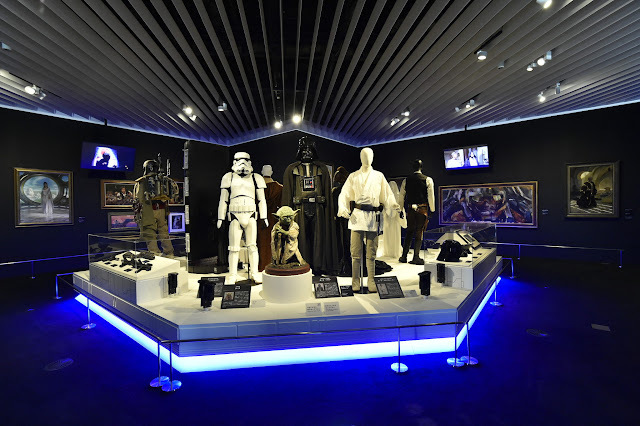 The Star Wars: Visions Exhibition will premier 60 pieces of original art work on display to the public for the first time and over a 100 artefacts of; concept art, costumes, sculptures and props used in the making of the Star Wars series on loan from the Lucas Museum of Narrative Art. As it turns out the force of kismet or manifest destiny came into play and after about a week of going full out and making the best use of my JR Pass to cover as much of my ambitious itinerary as possible. I highly recommended a Japan Rail Pass if you would like to get around Japan. I had no comprehension of how big Tokyo actually is, the distances between landmarks or how wide the cultural differences are - everything took longer and more effort, combined with the heat pretty soon I was exhausted. So I decided to take it easy and hang out in Tokyo. After a late breakfast of scrambled eggs I shot in to one of the most vibrant and thrilling cities on Earth and had a day to kill. 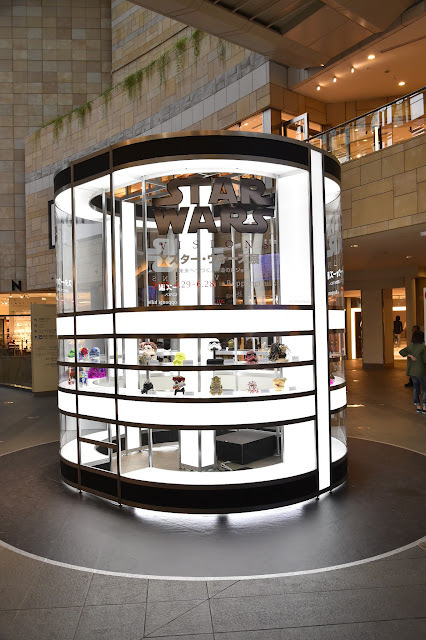 - Visit Star Case the renowned Star Wars shop and find a Legacy Millennium Falcon in good condition and either buy it for an acceptable bounty or try win it in a game of cards. 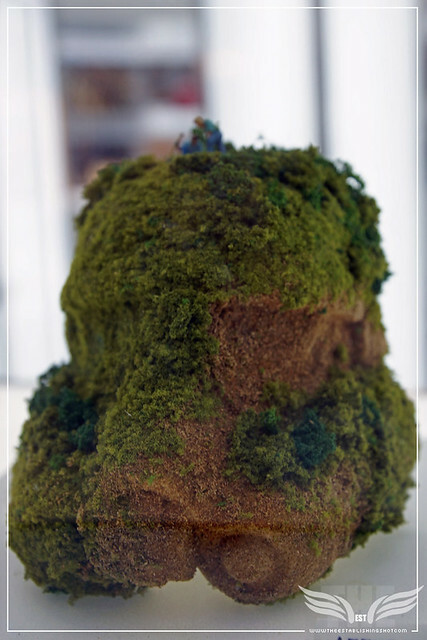 - Visit Setagaya Art Museum and view the Toho Studios Exhibition. 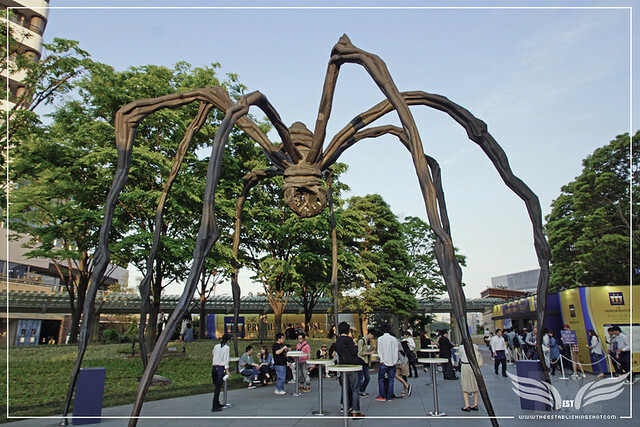 After visiting Gojiro in Midtown Tokyo I took a long-cut and arrived at the Roppongi Hills Mori Tower I was immediately drawn to the 9 metre high bronze sculpture of a giant spider displayed by the Mori Art Museum in Roku-Roku Plaza. If you are a regular reader you may recognise that Louise Bourgeois' Maman was the inspiration for MB&F's artistic time piece Arachnophobia in my last post. The Mori Tower is an absolutely huge 54 story upmarket building, in fact it might just be the largest building in the world and is definitely the sixth tallest in Tokyo at the moment. The lower six floors are similar to a shopping mall, then office space up to the top six floors which are taken up by the Mori Arts Center and Art Museum that includes the newly renovated Sky Gallery or Tokyo City View Observation Deck and an open-air roof deck on the top floor. At the same time there were a number of other exhibitions including; Simple Forms Contemplating Beauty and a Naruto (a very popular Japanese Manga) exhibit that I had considered visiting had I more time. I headed into the lobby area of the Mori Tower to ask for directions to the exhibition, which was a stroke of luck as I noticed a display cabinet housing an army of tiny Stormtroopers resembling a mini terracotta soldier collection being headed by Darth Vader and two of the Emperor's Royal Guards.I made a note to return and take some photos on my way back out but really wanted to get up to the Star Wars: Visions Exhibition as soon as possible - I had heard of large queues of fans with a wait time anywhere from 90 minutes to six hours to get in. Fortunately that was not the case at all. The young lady at the information desk explained where I should go and whilst chatting with her I noticed a pile of programmes for the exhibition and thought I would grab one as a memento. 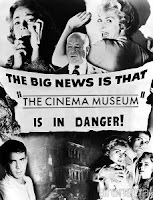 I made my way back out and around the outside of the building, as more and more signage and banners for the exhibition appeared my excitement grew and I was quite giddy with anticipation. Up a couple of floors in a lift, across a bridge walkway, up an escalator, into the dedicated Mori Arts Museum reception area, tickets in hand I took a lift up to the 52nd floor. 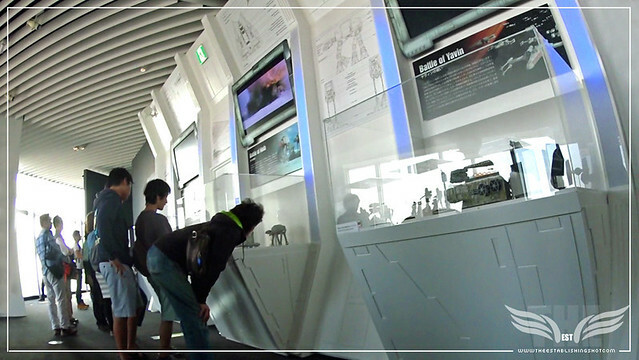 Star Wars Visions Exhibition Tokyo - Copyright © Lucasfilm Ltd. and TM. All Rights Reserved. Through some winding corridors only stopping to look at the view from above, we were so high that it felt like I was floating above the earth in fact being on the on the mostly white and floor to ceiling windowed 52nd floor was not to dissimilar to being in the docking bay of a Death Star or Lando Calrissian's Cloud City, and later on when I made my way to the industrial spires of the roof it felt a lot like like I had fallen out the bottom of Cloud City, so kudos on a great location for the Star Wars: Visions Exhibition. 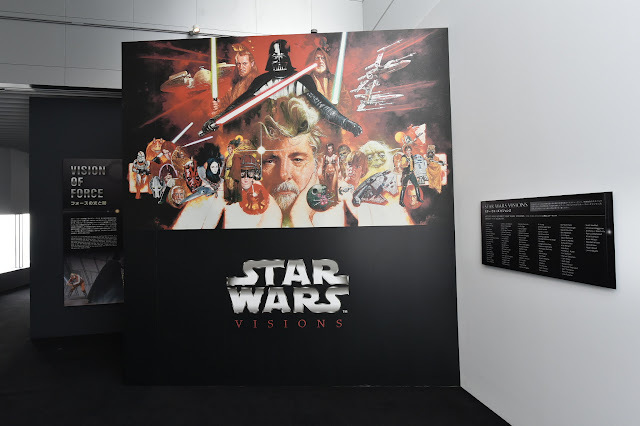 It looked like the Star Wars Visions Exhibition was about the influences on George Lucas that helped shape his vision for Star Wars and Lucas had commissioned a number of renowned artists to bring their own visions of the Star Wars universe to life. 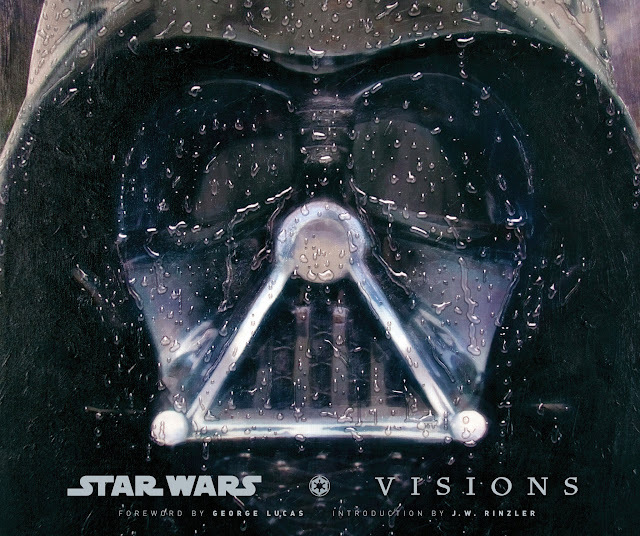 The art created by these artists is presented in a glossy 176 page book called Star Wars Art: Visions from Abrams Books which further expands on the Star Wars: Visions concept and the artists involved. Just as George Lucas drew upon the work of N. C. Wyeth and Norman Rockwell for his own visual inspiration, he has now invited more than 100 well-known and promising artists to draw upon the entire Star Wars galaxy for inspiration. Star Wars: Visions collects these magnificent artworks for the first time. Featuring pieces by renowned artists such as Amano, Allan R. Banks, Harley Brown, Gary Carter, James Christensen, Michael Coleman, Kinuko Craft, Jim Dietz, Phillipe Druillet, Donato Giancola, Ann Hanson, H. R. Giger, Daniel Greene, Ron Kleeman, Arantzazu Martinez, Syd Mead, Moebius, Paul Oxborough, Alex Ross, Anthony J. Ryder, Dolfi Stoki, William Stout, Dan Thompson, Julie Bell and Boris Vallejo, Scott Waddell, and Jamie Wyeth, Star Wars: Visions is a breakthrough tribute to the worldwide inspiration that is Star Wars. Star Wars Visions - Copyright © 2010 Lucafilm Ltd. and TM. All Rights Reserved. So it looked like the Star Wars: Visions Exhibition was built around a new book called Star Wars: Visions. 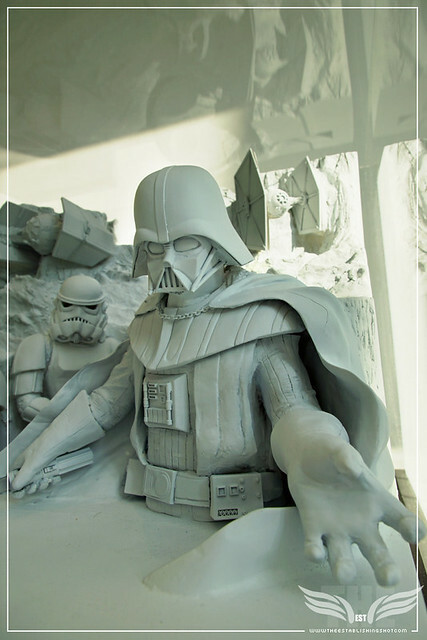 Which was a collection of artwork by talented artists reinterpreting the Star Wars universe in their own way. As well as a ton of props from the films. 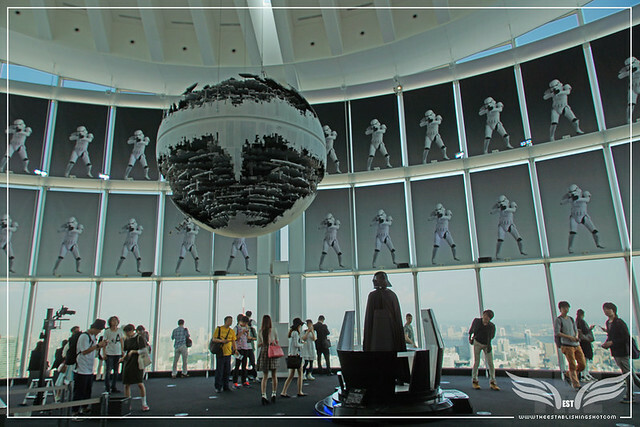 The Star Wars: Visions Exhibition took up approximately half of the 52nd floor and comprised of 6 main collections: The Original Vision, Vision of BATTLE, Vision of SAGA, Vision of GALAXY, Vision of FORCE and Vision of DROID running sequentially around the outer side of the Sky Gallery with a Cloud City like view of Tokyo below through the floor to ceiling windows. 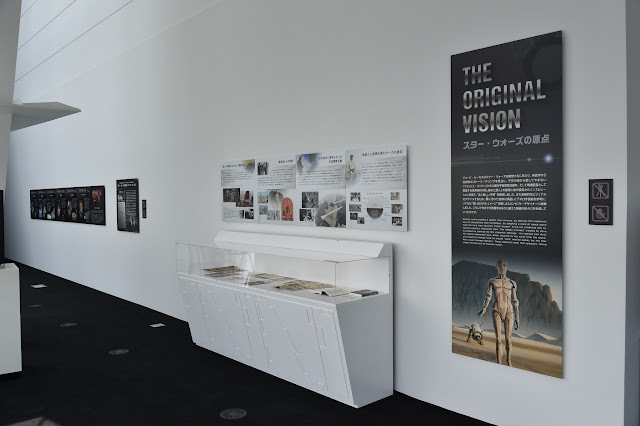 The Visions collections outlined Lucas' influences, the history of the previous 6 films, the part the force plays within the Jedi and Sith allegiances, notable battles & weaponry, the Star Wars galaxies, planets, ecosystems, lifeforms and characters from the films - as well as other loosely collected Star Wars works, memorabilia and merchandise loosely collated on display throughout the Mori Building. The epic Star Wars saga still captures the imagination of audiences with its universal and unifying vision. The Star Wars: Visions Exhibition is in part to acknowledge the many talented creative people, with whose efforts and talent the vision of Star Wars could not have been achieved. Star Wars Visions delivers a new look at the Star Wars universe and will hopefully inspire the creativity of a new generation. Even before checking in at the visitor desk I was distracted as - in the centre of the large mostly glass room you couldn't miss Darth Vader in his his Meditation Chamber or pod as first seen in Star Wars: Episode V The Empire Strikes Back and returning in the deleted scenes of Star Wars: Episode VI Return of the Jedi. To complete the immersive ambience every now and then a light show would kick in to simulate a fire fight accompanied by the iconic opening notes of John Williams' The Imperial March also known as Darth Vader's Theme. I was ecstatic and rushed over casually made my way over. 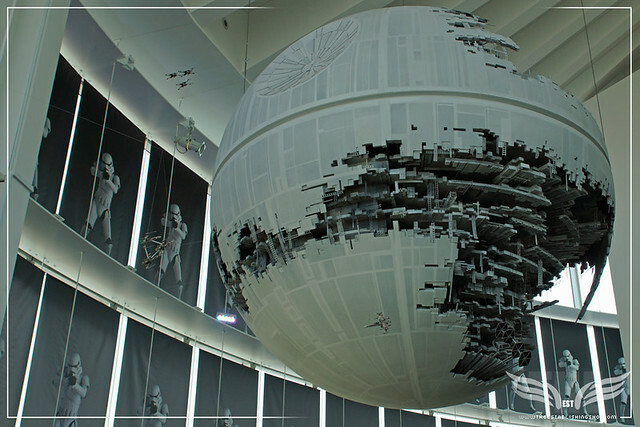 Above Vader hung a scale model of the still under construction Death Star II from Return of the Jedi and you you see into it's exposed superstructure. In the orbital vicinity of the Death Star there were a number of Red Squadron Rebellion Assault Class X-wing starfighters engaged in dogfights with Galactic Empire's TIE fighters, at least one of the Empire's squadrons giving chase was in an incomplete elite Black Squadron formation led by what looked like Black Leader himself - Darth Vader in a TIE Advanced x1 prototype star fighter. Was that Mauler and Backstabber following? Even further above, surrounding most of the room a battalion wall of Stormtroopers lined the whited out windows. Back down to eye level you couldn't miss the giant print of Masey's poignant and unforgettable Regrets featuring Darth Vader's head with rain streaming down it. 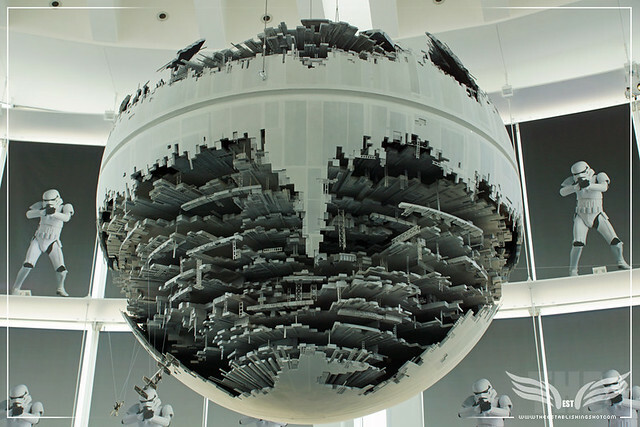 There was a display looping clips featuring the Death Star II and information about the pieces on display in Japanese, in fact sadly most of the detailed display information was in Japanese, fortunately some of the sectional headline information was in English. 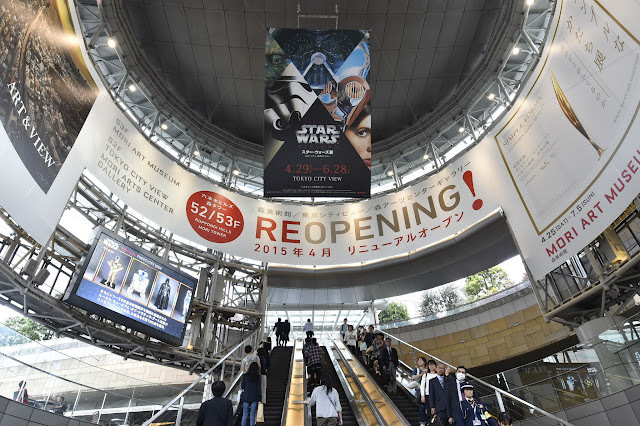 On the Star Wars: Visions Exhibition site George Lucas comments that the exhibition is curated and organised with the artistic sensibilities of Japan in mind. So although some allowance had been made for English speakers the exhibition was very clearly aimed at a Japanese audience. Which is why it was lucky I picked up the Star Wars: Visions Exhibition programme on the ground floor as it turned out to be really useful as it had a map and some English information. Sadly from this point on - no photos were allowed so I have had to rely on my unreliable and hardly legible notes and scribbled diagrams made on the day. 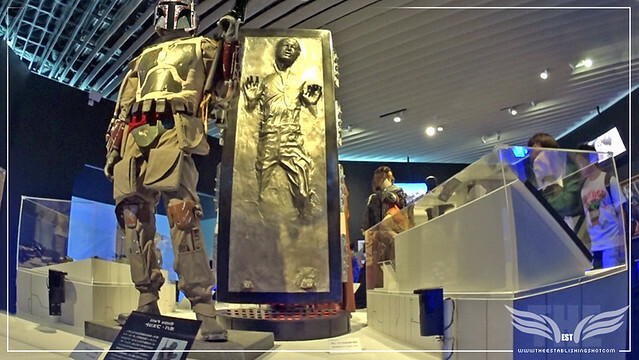 I have tried to be as detailed as possible as a while back when I uploaded photos from The London Film Museum's exceptional 2007 Star Wars: The Exhibition for years afterwards my photos popped up on Star Wars, prop and model forums with fans using them as a reference or trying to identify ships or characters. So I have made the effort to try and be as specific as possible off the bat. I have also added videos from other sources to add some pizzaz and give readers a reference. Star Wars Visions Exhibition Tokyo The Original Vision - Copyright © Lucasfilm Ltd. and TM. All Rights Reserved. When creating a new universe for Star Wars, George Lucas drew on the influences of his childhood like a traditional way of storytelling from mythology, the style of space opera of Flash Gordon and primary inspiration from Akira Kurosawa's The Hidden Fortress particularly the characters. 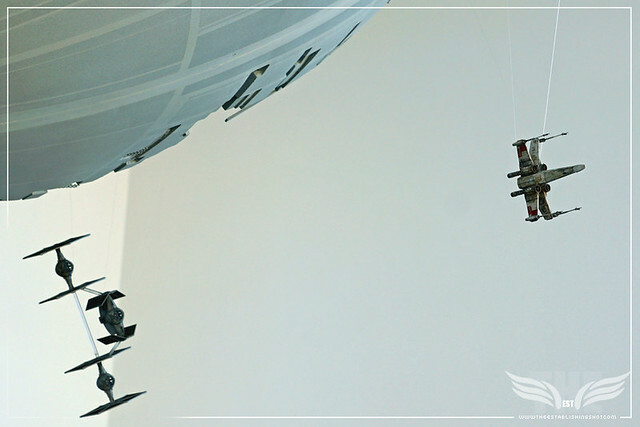 He noticed how dirty the Apollo spacecraft was, when it returned to the earth from the space and asked his design crew to create a 'used' looking galaxy for the Star Wars visual concept designs. Those elements gradually took shape as a complete movie. This was a fairly small display with most of the explanatory text in Japanese, it featured collages of early concept work from Ralph McQuarrie, characters taking shape from initial concepts to the characters we see on screen, illustrations showing how Star Wars drew on The Hero's Journey as featured in Joseph Campbell's book The Hero with A Thousand Faces, just below - Campbell's book was on display to the relevant pages. Pages and promotional imagery from Akira Kurosawa's The Hidden Fortress. A batch of Flash Gordon & the first adaptation of Star Wars comics showing some of the influences that fed into George Lucas' original vision and how in turn Star Wars has grown, and fed others creativity, a major theme of the exhibition. And finally brief synopses of the previous six Star Wars films to refresh our memory. At the entrance into the second collection, we were greeted by Manuel Sanjulian's large and stunning homage to George Lucas and his vision spanning the whole Star Wars saga - George Lucas’s World and a full list of all the artists that had joined Star Wars: Visions. Running through the entire Star Wars universe, is the flow of The Force. An energy emanating from all life forms, a mysterious presence that binds the galaxy together. The Force has two sides; enlightenment - the light and the dark side. 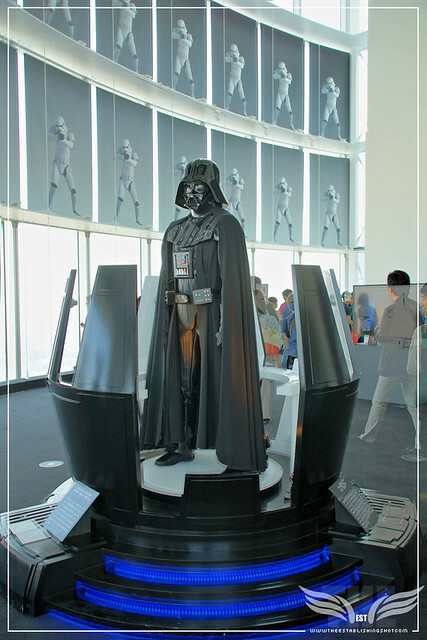 Star Wars Visions Exhibition Tokyo Vision of Force - Copyright © Lucasfilm Ltd. and TM. All Rights Reserved. Jedi Knights have embraced the light side giving them their purpose - maintaining peace as the guardian of the galaxy, while the Sith and their disciples have turned to the dark side and wish to control the galaxy by fear and anger. It can be said that both sides represent the good and evil of the Force, they can give or save life, or as it is part of the natural order, even take it away. 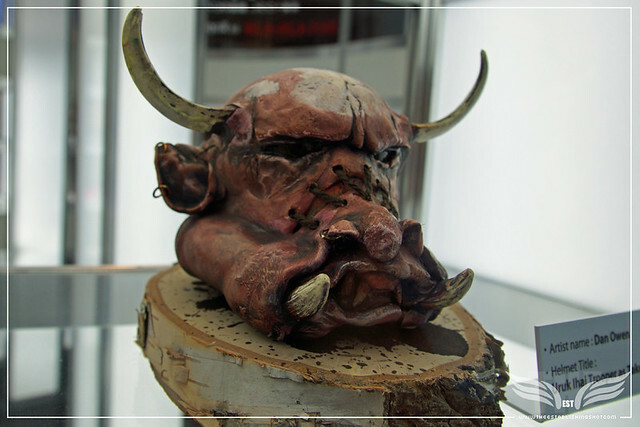 Along with the range of Jedi and the Sith lightsabers used in the making of the films, works of art embodying and representing the theme of The Force were on display. Along with artistic interpretations of The Force like; Philippe Druillet's Hommage à Georges Lucas, donc à Star Wars (A Tribute to Georges Lucas, and so, to Star Wars), Robert Bailey's Now My Enemy, Arantzazu Martínez's Rancor, Scott Wadell's Diptych, Will Wilson's Dawn of Maul and others. 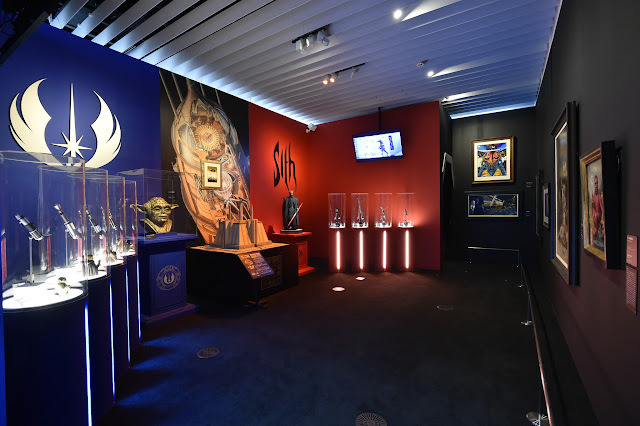 The Vision of Force collection was built around the centre piece of a scale model Jedi Temple, on the wall behind it a large architectural Cutaway illustration of the top of the High Council Tower and a framed oil painting on canvas of the Jedi Temple by Ivan Berryman. The rest of the room had been divided into red for the Sith and blue for the Jedi. In the Jedi area Lewis Mortsy's large bronzonium Bust of Yoda on its pedestal used in Star Wars: Episode II - Attack of the Clones seen in the Jedi Temple Library of the Jedi Archives in the Jedi Temple in. Further left the lightsabers used by Mace Windu, Obi-Wan Kenobi, Luke Skywalker and Yoda, with mini busts of each accompanying the lightsabers. 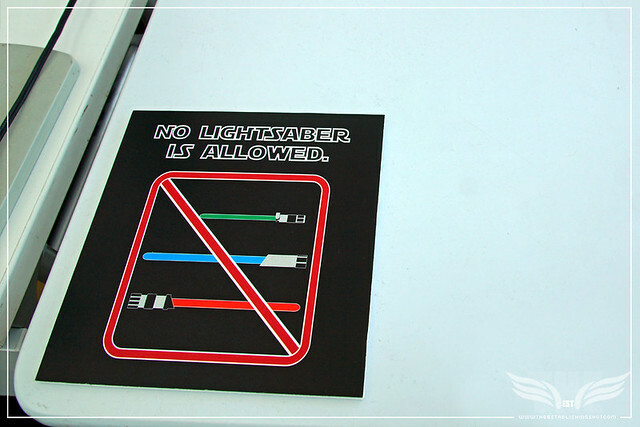 Some of the lightsabers presented were the original screen used versions and some were copies. On the right of the Jedi Temple with the red motif the Sith collection. A gorgeous sculpture of Darth Maul, then the Sith lightsaber collection which included Darth Vader's, Darth Maul's double bladed sabre, Count Dooku's and Darth Sidious'. Above them, for reference, a display looping video clips of fights between the Jedi and Sith. The next collection was one of my favourites and I stayed here for a while taking in the pieces on display, it was a real joy to see the characters from Star Wars in combat scenarios from the films as well as most of the starships and vehicles in the major battles. Much of the story of Star Wars is the history of the battles that are eponymous to its title. From the huge Droid Army being activated, through the military advanced with Clone Troopers born from clone manufacturing technology. 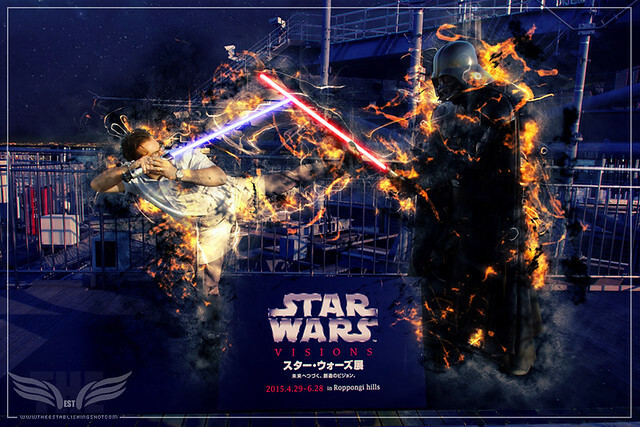 Star Wars Visions Exhibition Tokyo Vision of Battle - Copyright © Lucasfilm Ltd. and TM. All Rights Reserved. 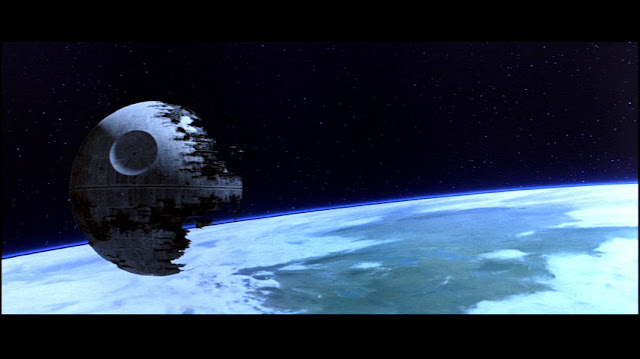 The epic battles of Star Wars entered a new phase with the advent of huge technological weapons such as the ultimate Space battleship - The Death Star, with the destructive power to destroy a Star Destroyer or even planets. The Vision of Battle collection covered five climactic battles; the Battle of Naboo, Battle of Geonosis, Battle of Yavin, Battle of Hoth and the Battle of Endor, the final battle from Star Wars: Episode VI - Return of the Jedi. 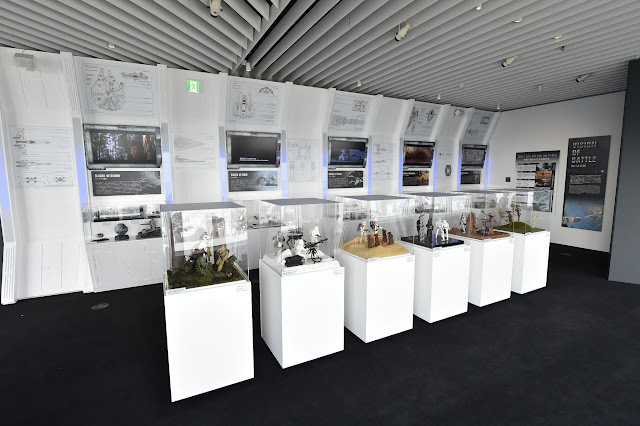 Running along the wall displays featuring miniatures of the key Space ships, weapons and vehicles from the battles accompanied by blueprints & schematics of the ships, short breakdowns of the battles as well as video clips from each battle scene for reference. 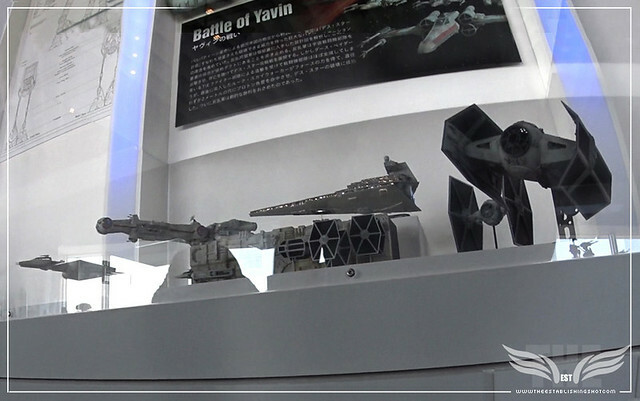 To give you an idea of the detail in the display - the Battle of Yavin display featured lite up models by model makers that included; a Tantive IV - Blockade runner, BTL Y-wing starfighter, Tie Fighters and a Y-wing engaged in a Death Star Trench Battle, a Star Destroyer, TIE Fighter and Darth Vader's TIE Advanced x1 Fighter to name a few. In an island of cube display cases running down the middle of the room dioramas scenes featuring a look at characters from select moments from all six battle grounds could be viewed like; Battle Droids on their Single Trooper Aerial Platform from Star Wars: Episode I - The Phantom Menace, Clones and Droids, including C-P30's transplanted head fight in the Executioner's Arena on Geonosis, Stormtroopers, a TIE fighter pilot and a senior military man on the Death Star I, Desert Stormtroopers and Jawas on Tatooine. Cold weather assault Stormtroopers handling a Mark II Medium Repeating Blaster Cannon, a Viper Probe Droid and Han Solo on I and finally Princess Leia and Han Solo fighting with Scout Troopers for control of the Speeder Bikes on Endor. 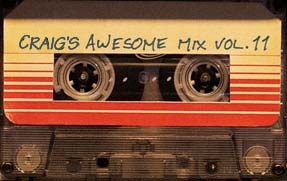 “A long time ago”, are the words that set the tone from the the beginning of the epic saga of Star Wars set in Kanata or a galaxy far far away. At the centre of the saga is Anakin and the two generations of characters that surround him (Luke, Leia, Han Solo, Yoda, Obi -Wan Kenobi , etc.). He is an extraordinary presence, “the chosen one” expected to bring harmony to the force that dwells in the universe between Jedi and Sith. But Anakin committed himself to the dark side trying to save his wife – this portrait eloquently symbolises the Star Wars Saga. Star Wars Visions Exhibition Tokyo Vision of Saga - Copyright © Lucasfilm Ltd. and TM. All Rights Reserved. 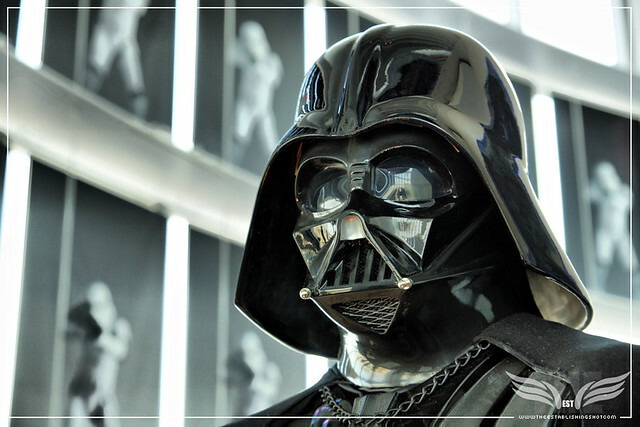 In the Vision of Saga collection you can view costumes and props actually used in shooting by characters centred around Vader's presence. Amongst the artworks on the walls I spotted; Dorian Cleavenger's Padmé, Serge Michaels and Michael Malm's Padmé’s Dream/Slipping Away, Douglas Fryer's Padmé Amidala, Carl J. Samson's Padmé Resplendent with Naboo, Donato Giancola's Senator Leia Organa, Krystii Melaine's Fur Balls, Ann Hanson's On the Hunt, Michael Grimaldi's Incident at Mos Eisley Spaceport, Raymond Swanland's Shadows of Tatooine, Davis Palumbo's Escape, Juan Carlos Ferrigno's Podracers, Steven J. Levin's Portrait of Darth Vader, Jérôme Lagarrigue's Untitled (Luke Skywalker in Cockpit), Donato Giancola's Obi-Wan Kenobi, Jacob A. Pfeiffer's Luke’s Lesson, Nicholas Coleman's To Be a Jedi, Yoshitaka Amano's fantastic Darth Vader, the original acrylic Masey's Regrets and Glenn Harrington's Luke and the Death of Yoda. In the centre of the room I gaped at the glorious display of costumes used in the making of Star Wars. In the centre Darth Vader's full armour outfit (Serial number: E-3778Q-1), as in the saga of where all are pulled into his gravity - costumes surrounded him; an Imperial Stormtrooper, a Yoda puppet, given the period of other costumes on display I assume that this is a Stuart Freeborn Yoda as used in Star Wars V – VI. But possibly not as it seemed in excellent condition given its age. I was standing in front of the Yoda. Luke Skywalker's original white & beige outfit that he wore the first time we were introduced to him on Tatooine in Star Wars: Episode IV - A New Hope. Han Solo's classic cavalry outfit, as I call it anyway. Princess Leia Oregano's white hooded Alderaan Gown, Queen Amidala's gorgeous Japanese inspired Black Travel Gown and headpiece from Star Wars: Episode I - The Phantom Menace. Obi-Wan Kenobi's Jedi Robe, Anakin Skywalker's Pod racing outfit including his goggles, Boba Fett, yes you read that correctly Boba motherflippin Fett! And in tow he had the life-size carbon frozen Carbonite Han Solo figure as seen in climax of Star Wars V: The Empire Strikes Back. 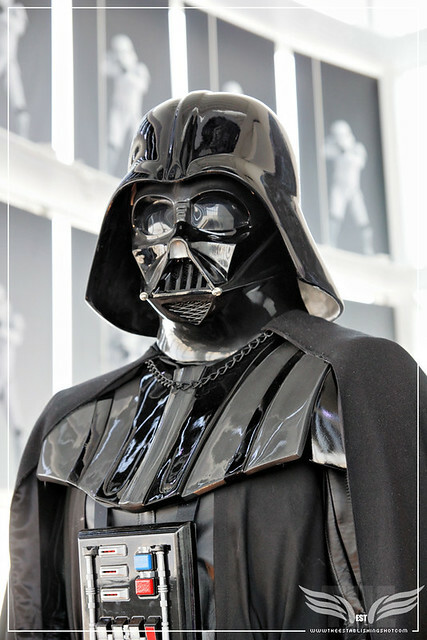 In a glass display case you could view Darth Vader's Helmet, Breathe Mask and neck brace or collar that completes his armour mobile life support. In another display case some small hand arms including; a Naboo Blaster or or as Star Wars fans might recognise it the S-5 Heavy Blaster Pistol made by Theed Arms and used by Royal Naboo Security Forces in Star Wars: Episode I - The Phantom Menace. A Battle Droid E-5 Blaster Rifle, an Alderaan Blaster also known as the Alderaan Stun Blaster used by Captain Antilles in Star Wars: Episode III - Revenge of the Sith. Leia's Blaster from Star Wars: Episode VI - Return of the Jedi as used on Endor a modified short barrel Sporting Blaster Pistol from DDC (Drearian Defense Conglomerate) and finally Luke's Jedi Training Remote or rather Han Solo's Marksman-H Combat Remote aka Seeker Droid famously used by Luke Skywalker aboard the Millennium Falcon when starting his blindfolded Jedi training in Star Wars: Episode IV A New Hope. The next display case Han Solo's DL-44 Heavy Blaster Pistol, Boba Fett's EE-3 Carbine Rifle, a Rebel DH-17 Blaster manufactured by BlasTech Industries and an Imperial Stormtrooper E-11 Blaster Rifle. 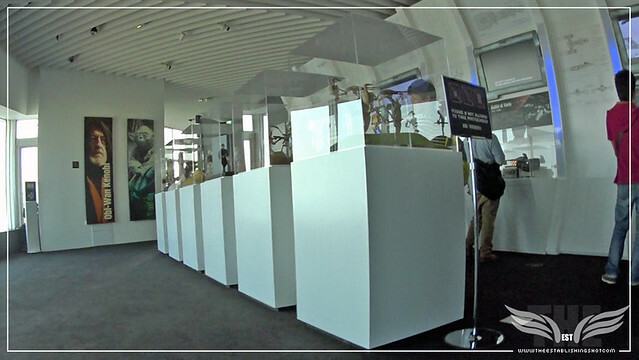 The final display case housed Han Solo's White Electrobinoculars used on Hoth in Star Wars: Episode V - The Empire Strikes Back as well as three gorgeous concept art pieces from master visioneer Ralph McQuarrie for The Empire Strikes Back - Luke on Hoth, Luke Riding a Tauntaun and from the climax Luke Climbs Onto Gantry Vane Over Reactor Shaft. Noticeably the full Darth Vader costume was in the centre of the room back turned to the young optimistic Anakin in pod racing gear behind him. In front of him his head facing, at the exact same eye height, Masey's Regrets in a seemingly symbolic mirror reflection. Another absolutely stunning collection followed - showing the breadth and variety of the Star Wars universe this collection was conjoined with the final smaller collection focussed on Droids. Before entering we could peruse a map of the known Star Wars universe. The galaxy of Star Wars is formed of a billion stars, it is shaped like a spiral or windmill and as many as 120,000 light years in diameter. Amongst them, intelligent life has been recorded on desert planets, jungle satellites, ice planets, volcanic planets, urban planets. 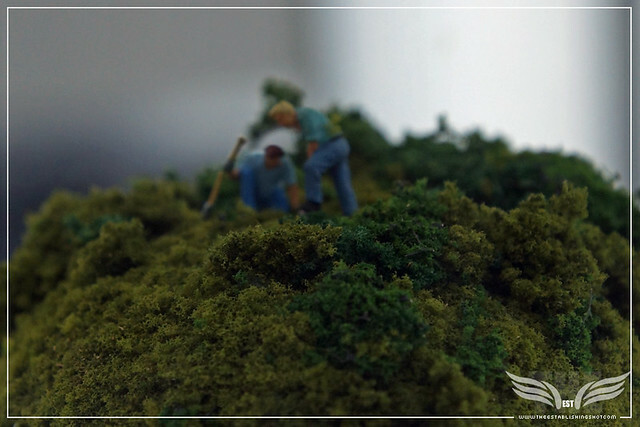 In each of the planet's environments numerous adapted and biological organisms as well as non-human alien races have been confirmed. 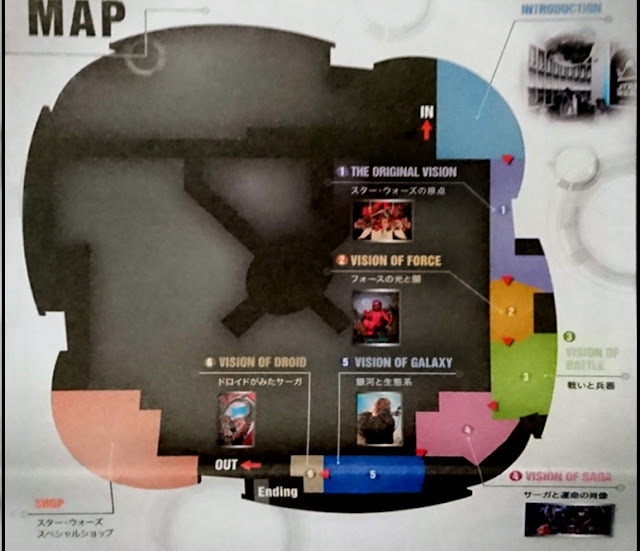 Star Wars Visions Exhibition Tokyo Vision of Galaxy - Copyright © Lucasfilm Ltd. and TM. All Rights Reserved. 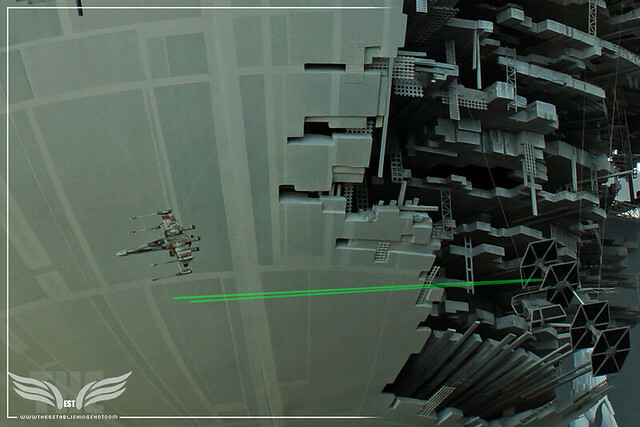 Hyperspace trade routes were pioneered with the invention of hyperdrive allowing faster than light travel, exchange between thousands of previously isolated intelligent lifeforms, was achieved - this eventually led to the founding of the Galactic Republic. In the Vision of Galaxy you can see some of the unique creatures and vividly painted works of the inhabitants of the planets of the Star Wars Galaxy, you can view costumes worn by these characters as well as Jabba the Hutt and an Ewok used in the making of Star Wars. The space was painted in a dark blue motif with planets floating in space. The Vision of Galaxy Collection was loosely collated by different planets; Naboo, Tatooine, Kashyyyk and their inhabitants. On the walls concept art, imagery from the films and Visions artwork including; Liam Sharp's Rancor Hunters, Jeremy Lipking's Yobana, Evan Wilson's Sleeping Aayla, Bluescreen Twi'lek by Darren Kingsley, Tony Curanaj's A Good Find: Portrait of a Tusken Raider, David Ho's The Sacrifice, Ed Binkley's Tusken Sentries and a small untitled acrylic piece of a Jawa firing his Ion Blaster. Life size mannequins in display cases included; Lyn Me the Twi'lek performer from Jabba the Hutt's Palace in Star Wars: Episode VI Return of the Jedi Twi'lek, a lone Jawa with his Ion blaster about the same size as him/herself, a fearsome looking Tusken Raider with his Gaderffii Staff, an Ewok, a smaller statuette of a sluggish young Jabba the Hutt in his own grand display area, a large bandolier wearing Chewbacca bust, and an even smaller but very cool model of a Stormtrooper riding a Dewback. A display featuring scale models of a Rancor with Malakili his handler, a Tusken Raider riding a Bantha and Han Solo riding a Tauntaun. As well as display cases full of many small busts of characters from across the Star Wars saga. Then the Vision of DROID which took up a larger corner of the corner of the Vision of Galaxy collection. The C-3PO and R2-D2 droid team have a special place and function across the saga of Star Wars and its universe. Their continued presence through Episodes 1 to 6 are much beloved by fans around the world as well as a big favourite of George Lucas. 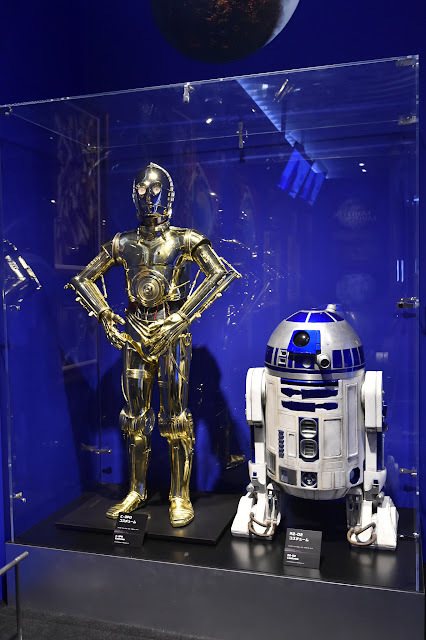 They have become a symbol of what Star Wars is and essentially this collection was focussed on the much loved droids R2-D2 and C-3PO (even then it was mostly C-3PO) - they are the only two characters to appear in all seven Star Wars films. And behold in a display case you could see both R2-D2 and C-3PO close up. Star Wars Visions Exhibition Tokyo Vision of Droid - Copyright © Lucasfilm Ltd. and TM. All Rights Reserved. There was also information about how these two tie the entire series together and their contribution to the legacy of Star Wars. Artwork featuring the droids included; Christian Waggoner's large Worlds Collide, John Mattos' Threepio Descending the Staircase, Gregory Manchess' C-3PO and David Tutwiler's Droids. Finally as you leave there was a short video in Japanese key moments of the last six instalments of the epic Star Wars saga narrated by the droids. Feeling decidedly downbeat as I reached the end of the exhibition proper I made my way through the substantial gift shop. I say substantial as in terms of size and breadth of merchandise it was comparable to leading international art museums shops, it was absolutely massive and literally any Star Wars related merchandise you can think of - could be found (as well as variations from classic retro through to pared down Zen versions), replica helmets, masks, lightsabers, costumes, clothes, T-shirts, shoes, jewellery, Star Wars themed crockery, mugs, lunch boxes, bags, authentic Kokeshi Dolls (made from cherry trees), posters, action figures in a variety of styles, stationery, toys, games, books, gadgets, Computer peripherals, pins, patches, umbrellas, towels, you get the idea - they had it all. But like Masey's rainy Darth Vader I too have regrets - I was spent, by the time I got to the shop the last thing I felt like doing was navigating the crowded gift shop browsing. All I could think about was a long cool drink and relaxing a bit but I still had more adventure to come. Turning the corner, there was some additional display imagery, penny arcade souvenir machines and a pretty awesome lucite scale replica of the giant 3,500 ton ice monument built for the Sapporo Snow Festival 2015, this may have actually been an early concept model. Up to the The Mori Art Museum on next floor via an escalator to a secure locker as I didn't any bags or extras where I was going also because of potential security risks no bagas, extras, coins, etc were allowed Into a lift out into a metal industrial maze that had more than a passing resemblance to the inner workings of a Death Star, up the final steel stairs onto the 54th roof of the Roppongi Hills Mori Tower, at 270 metres up it is the highest outdoor observation deck in the Kantō region and offers spectacular views over the city of Tokyo. noExhausted but pumped I made my way down from the roof of Tokyo to the fourth floor peering into the twelve boutiques and pop up shops offering customised limited Star Wars gear and apparel. Before finding a nostalgia inducing display of 80 original and highly collectible Star Wars figurines that included some rare and very hard to find figurines from the original Trilogy. All having been sold out long since they were first released. If the George Lucas Storm Trooper was on display he was in disguise. On my way down I passed a large life size Lego Darth Vader and slightly smaller Lego Boba Fett. Star Wars Visions Exhibition Tokyo Visions of Art - Copyright © Lucasfilm Ltd. and TM. All Rights Reserved. Heading further down on the second floor I discovered a large circular display unit housing a collection of customised mini Storm trooper Helmets. 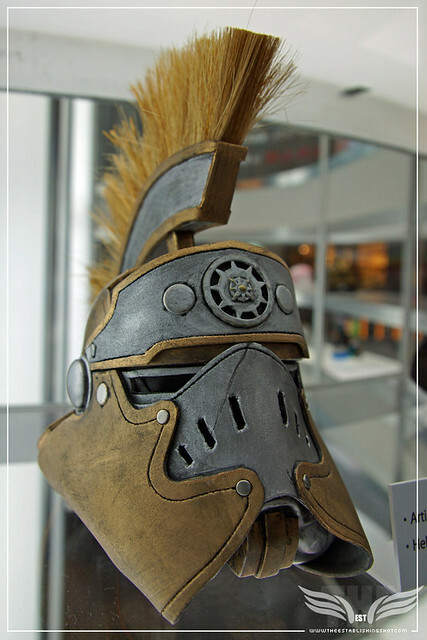 There were 40 vinyl helmets on display decorated by designers from Lucasfilm, Disney and Pixar. They seemed to have been selected for creativeness from the larger 300 piece Star Wars Legion Helmet Project. And finally this brought me back to the 150 piece mini Storm trooper figurine army I had discovered on my arrival completing my Star Wars: Visions experience and bringing it to a full circle. Going in I wasn't sure what to expect of the Star Wars: Visions Exhibition and by that I mean I really didn't know what the exhibition would entail or even what I would see. But with George Lucas' involvement I was half hoping to somehow recapture some of the earlier magic of his Star Wars films and as Lucas has bowed out from further films this would be the last hurrah so to speak. To that end I was looking forward to seeing props or pieces from the earlier films, some insight into Lucas' thinking for the Star Wars films and everything else like the Star Wars: Visions artwork would be a bonus. There was always the lingering hope that there may be a little surprise or two from the then upcoming Star Wars: The Force Awakens. Of course from the moment I reached the 52nd floor and entered the Sky Gallery it didn't matter what I was hoping or expecting - I was there, the place where dreams were made and realised. It was a joy to see pieces from the original trilogy and even exhilarating to see bits from the prequels. The art works were fascinating and ran the gamut from the style of the old masters through to new age neon pop art with both explicit and subtle references to the world of Star Wars. I was keen to see how some of my favourite artists had reinterpreted the Star Wars universe but there was something for everyone. I was drawn to immediate favourites, had to consider others before coming round and connecting with them whilst some weren't for me. But that's art and beauty is in the eye of the beholder but as a whole it was marvellous to see the concept of artists realising their own perceptions of the Star Wars universe with such breadth and variety. As far as references or pieces from the new Star Wars tales - after the exhibition moved on to its next destination in Japan I know the BB-8 Droid from The Force Awakens joined the exhibition - but it was only after seeing The Force Awakens that I understood just how much of George Lucas' vision was again realised on screen. As much as Lucas tries to distance himself from the new films as they come to fruition over at Disney. His original vision is very much at the heart of the The Force Awakens and in the same way the artists participating in the Visions exhibition applied their own visions to Lucas' - J.J. Abraham's film is a re-imaging of Lucas' Star Wars. Of course there are many wonderful contemporary twists and past the obvious connections to the previous six films there are many subtle referential nods as well as equally as many seemingly exciting and fresh new elements that draw on the past and revisit earlier abandoned concept work or storylines updating it and bringing it to life on screen making it feel like it fits right into the Star Wars series.. 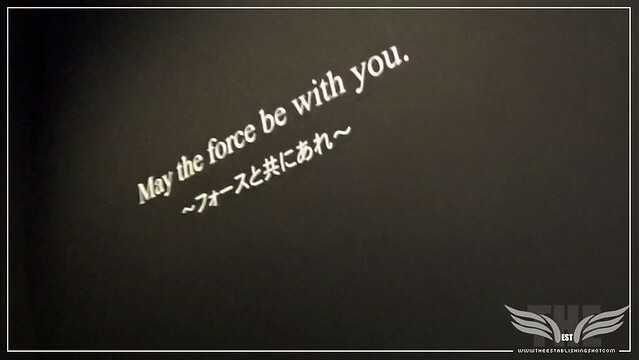 In the end, only after watching The Force Awakens could I fully appreciate the actual meaning of my badly translated notes referencing copy from the exhibition about the past being the future - "Continue to the future with the creation of the Star Wars Vision Exhibition." This was not just alluding to the saga taking place a long, long time ago but rather that the past is the future of Star Wars and specifically how the six key sections of the Star Wars: Visions Exhibition; The Original Vision, Vision of BATTLE, Vision of SAGA, Vision of GALAXY, Vision of FORCE and Vision of DROID are key elements in the ongoing Star Wars narrative and just as relevant as ever before. 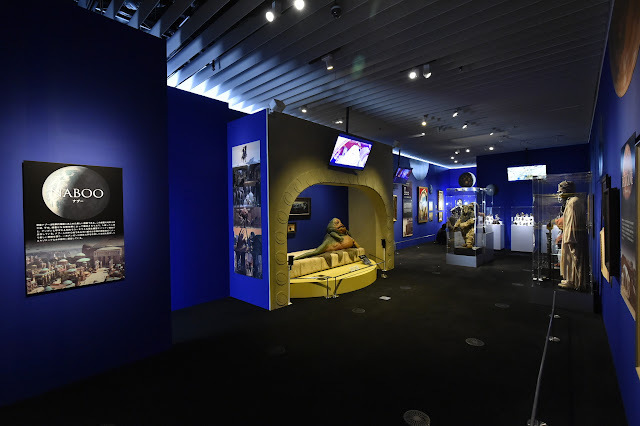 The Star Wars: Visions Exhibition is currently at the Sogo Museum of Art, Yokohama City until 5 January 2016.